A new render leak shows the front design of both the upcoming Samsung Galaxy S9 and S9 Plus. The phones are rumored to have more differences inside in terms of hardware than the Galaxy S9 and S8 Plus. Both the new S9 phones are scheduled to be officially revealed by Samsung on Feb. 25. MWC 2018 is just around the corner, kicking off on February 26th. Even more exciting is the impending announcement of the Samsung Galaxy S9 and S9 Plus the day before. The big question left is what these phones look like and what differences they may pack. And now we have the answer, as a new render leak reportedly shows off the front of both of these new flagship phones from Samsung. The leak came from VentureBeat and noted Internet gadget leaker Evan “@evleaks” Blass. Both the 5.8-inch Galaxy S9 and the 6.2-inch Galaxy S9 Plus look essentially the same as their year-old counterparts. They aren’t completely the same however, as both phones will have some key differences inside in terms of hardware. Blass states the standard S9 will have 4 GB of RAM and 64 GB of onboard storage, while the larger S9 Plus will have 6 GB of RAM and 128 GB of storage. Both phones are rumored to use the Qualcomm Snapdragon 845 processor for the US and China markets, and Samsung’s in-house Exynos 9810 chip everywhere else it is sold. As this week’s official reveal of Samsung Unpacked 2018 hinted at, the Galaxy S9 and S9 Plus will get some big camera improvements. Blass and previous rumor reports claim the S9 and S9 Plus will have a 12 MP rear camera that will support the making of “super-slow-mo” videos, along with variable aperture features. The S9 Plus, like 2017’s Galaxy Note 8, is supposed to have a dual camera setup, with a second 12 MP sensor that has a fixed aperture. The S9 Plus will reportedly place both sensors vertically, along with the rear fingerprint sensor. Both phones are rumored to have an 8 MP front-facing camera. The S9 variants are also supposed to have stereo speakers on the bottom, which is an improvement from the single speaker found on the S8, S8 Plus and Note 8 phones. 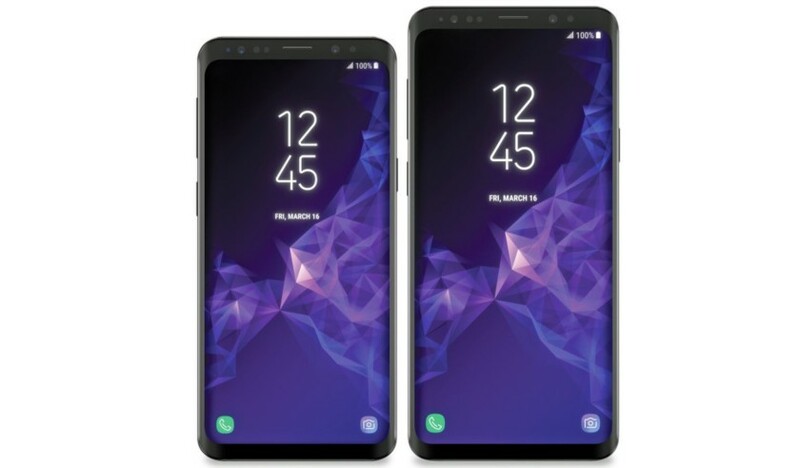 The Galaxy S9 and S9 Plus will reportedly go on sale on March 16, as hinted by the date shown in the renders leaked above. Stay tuned as we will have first-hand coverage of the new Samsung flagships on Feb. 25 at MWC 2018.